Buddy Lee getting a nice head rub from a student during class. Mr. Ledesma hanging out with Brady during his prep period. Ms. Martin giving Piper some love and affection. 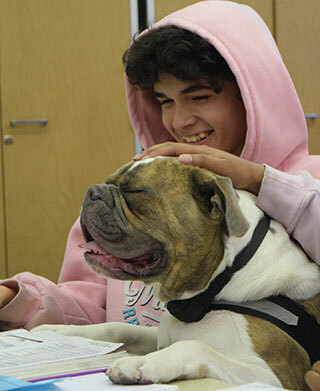 Learn all about the dogs that wander our halls. Dogs on Campus?? If you didn’t know, get a load of this. 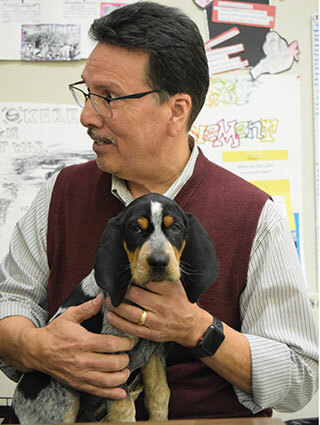 You may not know these faculty members but teachers Deborah Daniels, CJ Davis, and counselor Stephanie Martin all have dogs they bring to work with them. They of course got approval from Foothill High School's principal, Heather King, to do such a thing, but how wonderful is it that this happens here. This week I got the pleasure of capturing the cute and furry dogs with their owners. “What’s the best thing about bringing your dog to school?” is the question I asked each individual. ‘’I have a dog named Piper. He was born on Christmas but I got him on Valentine’s Day.’’ says Ms. Martin. Piper loves himself some peanut butter, so she brings a jar with her whenever Piper tags along. “He makes me feel happy and comfortable. Piper always makes me smile and he makes the kids happy.’’ Ms. Martin answered to the question. Next up is Ms. Daniels dog whose name is Buddy Lee Pickles. He got the name because Daniels love of pickles. “Pickles are awesome” says Daniels and she knew that her dog was going to be her buddy. That he was going to follow her around, but she didn’t want him to be named just Buddy. She wanted it be unique, hence the name Buddy Lee the one and only. “It’s really powerful to train him to be calm around people. Not only is it good for him, but the kids respond to him well and really love him,” said Daniels. One thing Buddy Lee loves is a ball. It can be any ball a basketball, a tennis ball, or a soccer ball. To Buddy Lee it doesn’t matter, because he’ll go after it. Lastly Mr. Davis has a dog named Brady. Brady was named after the Patriots won the super bowl, also that “Tom Brady is the best quarterback,” according to Davis. Funny thing is that Davis has a goat named Tom. So Tom the goat and Brady the dog match each other, what a combo! “I don’t have to worry about him at home if he’s here,” replied Davis when answering the question of the day. Davis also has a pug named Lucy who stays at home, Brady loves to steal his sisters bed. So if you’re ever feeling down, maybe swing by one of these teachers’ classroom and say hello to their furry friends!